1819. Iax Agolasky, a young assistant to a notable French explorer, sets off on a journey to the Russian wilderness. They soon discover a group of creatures living in a cave: children with animal traits. But are they animals, or are they human? Faced with questions of faith, science and the fundamentals of truth, tensions rise in the camp. Soon the children’s safety becomes threatened and Agolasky needs to act. The novel is based on the photo series and synopsis by Pekka Nikrus. Greek legends, fables and fairy tales all share an interest in mythical beings. In this book Sammalkorpi imagines what would happen if these creatures really existed. How would we respond? The answer to this question matters hugely. It determines what it means to be human. We celebrate Virve Sammalkorpi as one of the most powerful voices to emerge in Finnish literature for a generation. She published her first novel in 1999 and has written seven novels in total. 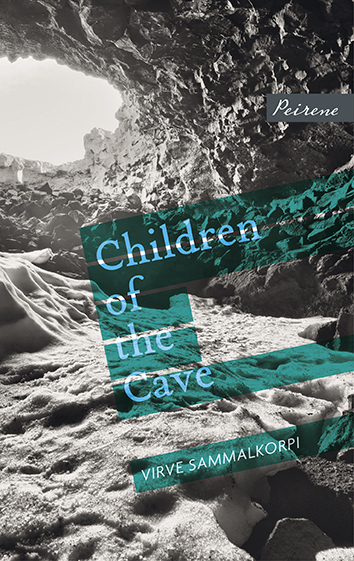 Sammalkorpi’s most recent novel, Children of The Cave, won both the 2017 Savonia Literature Prize and the Kuvastaja prize for the best Finnish Fantasy Novel. This is the first time one of her books has been translated into English. Emily Jeremiah and Fleur Jeremiah form a multilingual mother-and-daughter translation team. Emily and Fleur have co-translated works by numerous Finnish poets and novelists. They are also the translators of Peirene No. 7 The Brothers, Peirene No. 11 Mr Darwin’s Gardener, Peirene No. 16 White Hunger.